First some basics. Long-wave (or thermal) radiation is emitted from the surface of the planet and is largely absorbed in the atmosphere. Water vapour is the principle absorber of this radiation (and acknowledged as such by everybody). But exactly how important is it? In terms of mass, water vapour is much more prevalent (about 0.3% of atmospheric mass, compared to about 0.06% for CO2), and so is ~80% of all greenhouse gases by mass (~90% by volume). However, the radiative importance is less (since all molecules are not created equal). One way to quantify this is to take a radiation model and remove each long-wave absorber (principally the greenhouse gases, but also clouds and aerosols) and see what difference it makes to the amount of long-wave absorbed. This gives the minimum effect from each component. The complementary calculation, using only each particular absorber in turn, gives the maximum effect. Generally these will not be equal because of overlaps in the absorbing spectra (i.e. radiation at a particular frequency can either be absorbed by water vapour or CO2). ‘All’ includes aerosols, O3 and other minor gases as additional absorbers. The table shows the instantaneous change in long-wave aborption when each component or combination of components is removed using the radiation code from the GISS GCM. (The source code is available for those who have the patience to get it to work). This isn’t a perfect calculation but it’s quick and easy and is close enough to the right answer for our purposes. (N.B. This is very similar to what was done by Ramanathan and Coakley (1978) using a single column model – their numbers are in the table for reference). [Update Oct 2010:The numbers in this post have been somewhat updated and published in Schmidt et al (2010). ]. Because of the overlaps, the combined changes are larger than the changes due to each individual component. Another calculation is the instantaneous radiative forcing at the tropopause, but that is complicated for clouds, O3 and Aerosols which have impacts on solar radiation as well as the long wave, so I only give that value for the ‘pure’ greenhouse gases. Since we are looking at the whole of the present-day greenhouse effect (around 33 C), it is not surprising that the radiative forcings are very large compared to those calculated for the changes in the forcing. The factor of ~2 greater importance for water vapour compared to CO2 is consistent with the first calculation. So where does the oft quoted “98%” number come from? This proves to be a little difficult to track down. Richard Lindzen quoted it from the IPCC (1990) report in a 1991 QJRMS review* as being the effect of water vapour and stratiform clouds alone, with CO2 being less than 2%. However, after some fruitless searching I cannot find anything in the report to justify that (anyone?). The calculations here (and from other investigators) do not support such a large number and I find it particularly odd that Lindzen’s estimate does not appear to allow for any overlap. While water vapour is indeed the most important greenhouse gas, the issue that makes it a feedback (rather than a forcing) is the relatively short residence time for water in the atmosphere (around 10 days). To demonstrate how quickly water reacts, I did a GCM experiment where I removed all the water in the atmosphere and waited to see how quickly it would fill up again (through evaporation from the ocean) . The result is shown in the figure. It’s not a very exciting graph because the atmosphere fills up very quickly. 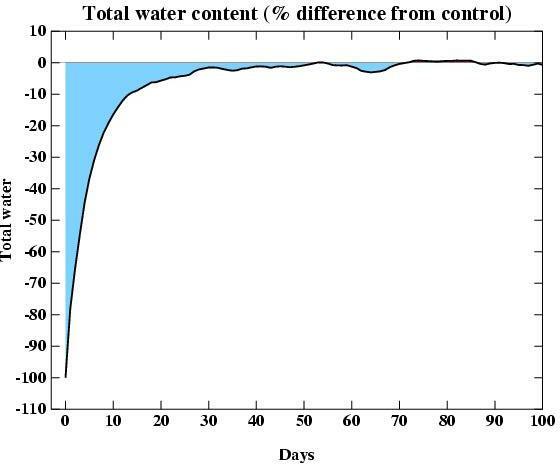 At Day 0 there is zero water, but after only 14 days, the water is back to 90% of its normal value, and after 50 days it’s back to within 1%. That’s less than 3 months. Compared to the residence time for perturbations to CO2 (decades to centuries) or CH4 (a decade), this is a really short time. Only the stratosphere is dry enough and with a long enough residence time (a few years) for the small anthropogenic inputs to be important. In this case (and in this case only) those additions can be considered a forcing. Oxidation of anthropogenic methane (which is a major source of stratospheric water) and, conceviably, direct deposition of water from increases in aircraft in the lower stratosphere, can increase stratospheric water and since that gives a radiative forcing effect, they do appear on the forcings bar chart (under “H2O from CH4“). Some scientists have argued that changes to irrigation and other land use changes (which effect evaporation) are also direct forcings to water vapour amounts, but I think it’s cleaner to think of that as an indirect water vapour response to the change. When surface temperatures change (whether from CO2 or solar forcing or volcanos etc. ), you can therefore expect water vapour to adjust quickly to reflect that. To first approximation, the water vapour adjusts to maintain constant relative humidity. It’s important to point out that this is a result of the models, not a built-in assumption. Since approximately constant relative humidity implies an increase in specific humidity for an increase in air temperatures, the total amount of water vapour will increase adding to the greenhouse trapping of long-wave radiation. This is the famed ‘water vapour feedback’. A closer look reveals that for a warming (in the GISS model at least) relative humidity increases slightly in the tropics, and decreases at mid latitudes. How do we know that the magnitude of this feedback is correctly simulated? A good test case is the response to the Pinatubo eruption. This caused cooling for up to 3 years after the eruption – plenty of time for water vapour to equilibriate to the cooler sea surface temperatures. Thus if models can simulate the observed decrease of water vapour at this time, it would be a good sign that they are basically correct. A good paper that demonstrated this was Soden et al (2002) (and the accompanying comment by Tony DelGenio). They found that using the observed volcanic aerosols as forcing the model produced very similar cooling to that observed. Moreover, the water vapour in the total column and in the upper troposphere decreased in line with satellite observations, and helped to increase the cooling by about 60% – in line with projections for increasing greenhouse gases. To be sure there are still some lingering uncertainties. Some recent data indicates that tropical upper tropopsheric water vapour does not quite keep up with constant relative humidity (Minschwaner and Dessler, 2004) (though they still found that the feedback was positive). Moist convection schemes in models are constantly being refined, and it’s possible that newer schemes will change things . However, given the Pinatubo results, the models are probably getting the broader picture reasonably correct. Really interesting. Does the model proof also the effects of the airline shutdown after 09.11? To me it is not clear if you consider only the profile of the vapour in the atmosphere, or if you consider also layering with the coulds and the massive effects the airplane have in modifying it. I’ve seen a slightly different “98%” argument made by climate skeptics (e.g., U. Berner in various popular brochures and articles): “98% of the greenhouse effect is natural and only 2% anthropogenic”. This is because the anthropogenic greenhouse gas forcing (~2.4 W/m2 until now, here IPCC is cited) is only ~2% of the total (“natural”) greenhouse forcing. What these people usually leave out, of course, is that the natural greenhouse effect warms the surface temperature by ~33 oC (all else being equal, notably albedo). A rough and linear back-of-envelope estimate of how large the 2% anthropogenic change in greenhouse effect might be: 2% of 33 oC is ~0.7 oC, very similar to what the more detailed and correct calculation gives. So, there is nothing wrong with this version of the 2% argument – except that it is often used in a context and in a way designed to mislead the public, i.e., it is used to suggest to a lay audience that “global warming is 98% natural”, so we are not responsible and can’t do anything about it. We’ve finally had an article on the single most important point in the climate change debate, i.e. climate sensitivity. Thanks for that. To first approximation, the water vapour adjusts to maintain constant relative humidity. It’s important to point out that this is a result of the models, not a built-in assumption. Now I’d just like make sure I understand what’s been said here. I’m a bit thick, so please bear with me on this. Does this mean that the results of the computer calculations produce a constant relative humidity – as opposed to the program (or model) assuming constant relative humidity to compute the increase in water vapour. #3 said Does this mean that the results of the computer calculations produce a constant relative humidity? as opposed to the program (or model) assuming constant relative humidity to compute the increase in water vapour. That is indeed the case. The constant relative humidity would be produced as a result of calculations that the models make regarding evaporation of water from the surface and then of moving this water about through convection and the dynamics of the model [and raining the water out again]. So what do the models predict (or project) that the additional water vapour contribution would be for a given rise in temperature. For example, if there was a change in GHG (WV not included) forcing which produced a temp rise of 1 deg C – by how much would that increase WV (in ppm) and what would that mean in terms of additional warming. Not sure realclimate would agree with this. For a change in ghg forcing of 2.4 W/m2 they would expect a warming of around 1.8 deg C, i.e. a sensitivity of 0.75 deg C per W/m2. I believe that Essenhigh might have produced some work showing that water accounts for 95 or 98% of the Greenhouse effect. It was an interesting and quite technical look at things but ended up using an average WV content of 4% because he said that if the global warming people can average temperature he could average water content!!???!! I took a look for it a while ago but it was no longer on the net. Maybe someone pointed out that WV changes in elevation as well as across the globe and that 4% was way off! Since it’s a coupled feedback process, you can’t really separate it out like this. This means the increase is of the order of 300 ppm – or have I got something wrong. Let me see if I got it. We emit CO2, which warms the world a bit, and this causes more water to vaporize & warm the world more to a higher (more or less) stabilized level. And reducing emissions, with nature aboring CO2 & atmospheric CO2 reducing, would cool the earth a bit, which would reduce water vapor, cooling the world more to a lower (more or less) stabilized level. So our emissions (or reductions) have an somewhat amplified effect, beyond a purely CO2 effect. Let me know if this is right. Sounds cool to me Lynn, the critical line is the one about residence time. It’s not the quantity(state) of water vapour that matters as much as the rate(residence time) of it’s cycling. A consequence of this is that water vapour is locally variable(15% – 100% in the temperate zone) depending (mostly) on the wind direction and season. In terms of climate change this seems to lead to the sorts of conditions that are prevailing where I live in the south west of Australia . Here we experienced record flooding last week following an equinoctial storm. So that, although the winter rainfall has ben declining steadily since the 1960’s, the average annual rainfall has been less affected due to increasing drought being offset by increasing storminess. The deviation is as affected as much as the mean. A large part of global warming is in fact located in Central Siberia and Canada. Given increasing population, the amount of water vapour emitted just by heating houses has also increased dramatically. Has this extra forcing by antropogenic water vapour in winter ever been considered? Because this is a synchronous forcing and not a feedback. Of course the half life of this antropogenic emission is very short, but the replenishment rate is also fairly constant during winter. I’m not sure that serious skeptics worry too much about the direct forcing from increased water vapor. What should be an issue of discussion is how the increased water vapor plays out in terms of increased cloud cover. As the now larger amount of water vapor rises it will sooner or later result in cloud formation and this will, during the day, cut off far more visible light than the amount of IR which is blocked from escaping during the night. A good figure for what this negative feedback from water vapor is must be used to offset the initial positive feedback. In this regard, it’s also necessary to realize that the forcing from a given amount of additional CO2 or H2O decreases as the total amount of each increases. The rule of thumb I’ve seen is that each doubling of CO2 adds a constant forcing. Does that rule apply to water vapor as well? You can see the area considered “western Australia” here http://www.bom.gov.au/cgi-bin/silo/reg/cli_chg/trendmap.cgi?page=cc&variable=rain&region=wa&season=0608&period=1960 and data locations here (seem to be very well represented in the “south west of Australia”) http://www.bom.gov.au/silo/products/cli_chg/rain_trendmaps.shtml , for which the portions of increased rainfall over the 1960-2004 time period (or 1970-2004 time period, if you select it) seems to roughly cancel-out the portions with decreased rainfall. As the trendline page states, the avg winter rainfall for the 1961-90 period was 65.37mm. Using the downloaded data, the entire 1900-2004 avg was 66.66mm, roughly the same as the 1961-1990 average. The 1960-2004 avg was 65.50mm. The 1970-2004 avg was 65.15mm. The 1980-2004 avg was 64.38mm. So there was a slight but minimal decline from 1960 to 1970, and then again to 1980. But then there was another uptick, as the 1990-2004 avg was 65.96mm. That doesn’t seem like a lot of variation to me. And those figures included 1999-2004, over which the average was just 47.69mm. Those years were weighted more heavily in the prior calculations as the starting time period was moved closer to the present. Eliminating the most recent 5 yrs of data would produce avgs of 67.81 (since 1900), 68.24 (since 1960), 68.77 (since 1970), 69.65 (since 1980), and 78.14 (since 1990). So winter rainfall averages had been INCREASING slightly since the 1960s and up until 1999, after which there has been a large decline. Also, using 1900-2004 averages, I come up with a ridiculous standard deviation of 23.79. Seems like you’d have a hard time finding a statistical trend anywhere in that data. Sorry, but I don’t see any increase in deviations, either. The std dev went-up slightly in the 60s, 70s, and 80s, but has dropped considerably in decades since. Now maybe you’re referring to the very “south west of Australia,” and the prior calculations cover to wide of an area. However, the trend maps on the website above show an increase in winter rainfall over most of southwest Australia (0-10mm/decade) with a small portion where there was a decrease in winter rainfall (0-10mm/decade) from 1970-present. 1960-present shows a much larger area of decreased rainfall with a greater magnitude (up to 40mm/decade). Going back to other maps shows similar albeit smaller rainfall decreases. In other words, the far southwest of Australia has seen an overall decrease in winter rainfall since 1960, but this appears to be generally confined to the 1960s themselves. It’s tough to say without actually having data to do calculations, but based on the difference between the 1960-present and 1970-present trend maps, it looks as if much of southwest Australia has seen an increase in winter rainfall from 1970-present and had a severe winter rainfall deficiency in the 1960s. “Even closer focus on water is given by solution of the Schuster-Schwarzschild equation applied to the U.S. Standard Atmosphere profiles for the variation of temperature, pressure, and air density with elevation (8). The results show that the average absorption coefficient obtained for the atmosphere closely corresponds to that for the 5.6-7.6 μm water radiation band, when water is in the concentration range 60-80% RH – on target for atmospheric conditions. The absorption coefficient is 1-2 orders of magnitude higher than the coefficient values for the CO2 bands at a concentration of 400 ppm. This would seem to eliminate CO2 and thus provide closure to that argument. Essenhigh appears not to know that the earth radiates pretty much like a blackbody at ~285 K (http://tinyurl.com/44k2h for a graph) There is about zilch intensity between 5.6 and 7.6 μm (~1300 – 1800 cm-1, the water bending mode) so in fact, there is not much IR to absorb in the bands Essenhigh talks about. Curious what he thinks the water vapor is absorbing at those wavelengths but it ain’t the IR from the earth or reradiated IR. Given this blunder, I think we can declare his overall position as similar to a flounder after ten days in the sun. Nice explanation of water vapor. Question 1- when the long wave radiation is trapped by water vapor and CO2 etc How much heat energy is trapped? Do the models calculate this based on a concentration AND temperature/humidity dependant equation every 20-30 min cycle? I would assume that the GHG molecules do not saturate, ie trap the maximum amount of energy that they are capable of, just like the regular N2 and O2 molecules will not trap all the (smaller amount of)heat they are capable of, always leaving some room to heat up more as the solar flux gets hotter during the day, or during the season. Q2:Since the sun on a daily basis warms and cools the atmosphere by 20+ degrees (evaporating the morning dew/water vapor on the grass as it warms!) then how does this daily and variable cycling impact the residence time concept? ie Just how REAL is the water vapor residence time graph above? Wouldn’t the water vapor readjust on the next daily cycle, and continue to adjust during the day as the daily temp and weather fluctuates? Related question- Is there any daily cycling of CO2? Is the CO2 concentration temp dependant? Is the amount that dissolves in the nightly washed out water vapor trivial? A hearty thanks to realclimate for doing an article on this. I can’t tell you how many times I have had to explain the idea that, because of its short residence time, water vapor is not a greenhouse gas that we have much direct control over but is an important feedback effect. Now, I can just refer people here! I wonder if someone could clarify the relationship between radiative forcing measured in watts per square meter with a temperature change in degrees celsius. It seems to me that a increased forcing of 2.5 w/m2 should have the same effect whether caused by increased radiation from the sun or increased greenhouse gases. I expect the relationship to be linear, but I keep seeing different values (such as in comment #6). Surely this has a standard, well known value. By the way, thank you for providing this good source of information, and especially the chance for feedback. What about a hydrogen economy in which we are generating very high levels of water vapor, and some hydrogen leaks as well. I read somewhere that this may have some negative impact, but I can’t remember. Seems by your discussion (I’m not sure) that since the water vapor is close to the ground, only the amount ordained by the warmth of the climate will be held in the atmosphere, the rest precipitating away. In response to #12, as the temperature increases, so does the capacity for air to retain moisture, so even if the quantity of water vapour is to increase, relative humidities may not. In other words, dewpoint depressions (T-Td) may remain the same. Since RHs need to approach 100% (T-Td needs to approach zero) for clouds to form and since these RHs may not increase despite the aforementioned increases in water vapour, cloud cover may not increase, or if it does, it will not be significant. Yes – I suspect you’re right. In fact, Stefan himself has responded to confirm this. However a couple of points are worth noting. 2. Is the 0.7 value supposed to be observed or calculated? The reported temp rise in the last century is not all down to increased ghg. Also when will the 1.8 deg increase actually happen. Interesting article. I did not see any mention of the phenomenon of extreme nighttime cooling in arid regions (deserts). This phenomenon is attributed to lack of water vapor in the atmosphere above those regions resulting in a greatly reduced local “greenhouse effect”. Doesn’t this contradict the idea that other molecules (carbon dioxide, etc.) contribute a lot to the whole-earth greenhouse effect? Paul Dwiggens comment is the wrong answer for the right reason. Yes, the temperature goes down rapidly in the desert at night because there is little water vapor in the air to capture the radiated IR, but there is a residual, according to Gavin’s table ~ 34%, due to the greenhouse gases. If there were no IR absorbers in the atmosphere the surface temperature would be ~ 256 K or -17 C.
The important thing about water is, it is saturated over most of the infrared spectrum. That means that 100% of the infrared radiation emitted by the ground is absorbed by the water vapor in the air. Whether there is more or less water vapor in the air sometimes, it doesn’t change the 100% absorption. That is what saturation means. Astronomers know a lot about this. It is why infrared telescopes are at extreme sites, on top of Mauna Kea or at the South Pole, where there is a lot lot lot less water vapor and so there is partial visibility at some infrared frequencies. At other frequencies the water vapor does not absorb. The atmosphere is rather transparent at those frequencies. There is some partial absorption by CO2, but it is not saturated because there is much less CO2 in the atmosphere, compared to water vapor. If you put more CO2 into the atmosphere, radiation at those frequencies is absorbed proportionally more. Note I made no mention of the residence time of either CO2 or H2O. In response to the selective and dishonest use of statistics by Michael Janowski in post #13 I’d refer readers to this map also published at the Bureau of Meteorology site and linked directly from the sites quoted by Mr Janowski. The map clearly shows that rainfall in the far south west has decreased by 50mm/10 years between 1950 and 2000. Furthermore there is extensive and long standing documentation of this rainfall decrease which was first observed back in the 1980’s and has continued. Most Western Australians will have seen the regularly published advertisements by the W.A. Water Authority showing the consequence of this decreasing rainfall on catchements over the last 40 years. The authority has a vested interest to conserve water so I suppose they could be exagerating but nobody in the south west seems to think so. Mr Janowski is obviously ignorant of the nature of the rainfall in the south west. Specifically he should be aware that the area defined as the south west has a rainfall that varies from 1000mm to 3-400mm. The south west corner(south west of a line from Perth to Albany) where the rainfall exceeds 700mm has a relatively stable climate dominated by winter rain with less than 20% variability in rainfall patterns. To the east of this line and making up more than 1/2 of the south west area on the maps he quoted, the rainfall is sporadic rather than seasonal. Hehehehehehehehehehehehe! Thank goodness for computers! Thank you very much for the excellent article and high level discussion. Interesting to think that there is only 1 inch of rain up there! From Gavin’s reply to 23: If the cloud/rainfall processes mysteriously altered to reduce the H20 level and feedback by 2.4 Watts/m2. This would require a one-off extra rainfall event of about 1/8 Inch?? Tricky to get all the modelling correct, I’m sure, but 30 watts/m2 does seem rather a lot compared to the 2.4 watts/m2 of calculated change. careful. I think Micheal J. has a point. You can get the raw data for winter rainfall here. If you download it and apply your favorite spreadsheet it looks like, while there has been a small downward trend in the 1970-2002 period, the variance of the winter rainfall is so high that the R^2 is only 0.006 – very, very low. The difference is that you’re looking at a much smaller region of the state, and there are a number of alternative hypothesis to explain the more pronounced decline in the south-west: deforestation, for example. You’re providing evidence of climate change, but it is pretty localized, rather than global. Extrapolating a regional trend is a bit dicey. I was somewhat surprised that Gavin felt the need to post this. I thought that increased water vapour from rising temperatures and water vapour as the principle LW radiation absorber – therefore a feedback and not a forcing – was just obvious. I had never heard a skeptic (needless to say, 3 in the same room – is this possible?) argue against climate change because naturally occurring water vapour is being neglected. I have never seen this used as a strategy in the mainstream press either. So this was a new one for me. Other attempts have been made to explain it. I got my initial understanding of the phenomenon from this paper The Long Time Scales of Human-Caused Climate Warming by Jerry Mahlman (formerly head of GFDL and now emeritus at NCAR here in Boulder). There is a very good explanation of this topic on pages 9 to 11 of this online PDF document. Also, I highly recommend this document in general for those of us on realclimate who are not climate scientists. Paul Brown in #28 suggest deforestation but that is just simply incorrect for the lower south west where the greatest decrease in rainfall has occurred. This is the one area of the south west that has not been cleared substantially and is still dominated by karri and jarrah forest. In W.A. rainfall comes in summer as a result of the summer monsoon and in winter as a result of the movement of the circumpolar front. In the north west and south west extremities these two sources of rain singly dominate the annual rainfall for these regions. Elsewhere rain fall comes from both sources. Consequently the decrease that is seen in the lower south west is clearly identifiable with changes in the winter rainfall patterns which are due in turn to the movement of the circumpolar front. The decreasing winter rainfall in the south west is due therefore to changes in the average position of the circumpolar front. Because W.A. is flat there are no significant orographic affects upon local rainfall. Because it is on the west side of the continent there is less interaction between tropical and polar moisture sources. Because the southern ocean is the only thing for thousand of miles in our weather quarter, changes in our weather could be considered to be indicative of changes in the southern hemisphere. IMHO those changes are due to global warming. an entirely reasonable hypothesis. Thanks for the explaination. BTW, Kleeman and Power (1995) “A simple atmospheric model of surface heat flux for use in ocean modeling studies”, Journal of Physical Oceanography, 25, 92-105. has a very interesting discussion of the temporal and spatial variability of relative humidity in the current climate. Globally over oceans, the relative humidity is almost everywhere near 0.8, despite the enormous variation which exists in temperatures. To the extent that spatial variations are an analogue for climate change, this result suggests that relative humidity (at least over the oceans) is likely to remain fairly constant under global warming. Where was I selective and/or dishonest? I threw out stats for a large number of periods from the available data. I actually felt like it was overkill. I did err with a few statements – I goofed and said the trend from 1960-present was as high as -40mm/decade, but it was only -30mm/decade. I obviously spent too much time with calculations you dimissed and not enough time discussing the maps (which I felt were much more obvious). But these do not change the fact that the BofM data and maps conflict with your assertions. If they are a poor source of data, I apologize. I was interested in your post and tried to find information relevant to it, and what I found conflicted with your post. First of all, that decrease is not between 1950 and 2000 – it’s between 1950 and 2004 as clearly stated on the map under the title. Secondly, the map does not “clearly show” such a decrease. It is almost HALF of what you claim it is (up to 30mm/10yrs, not 50mm/10yrs as you read it, or 40mm/10yrs as I had written in #13 for the 1960-present period!). Also, we should be careful about how to interpret the data (in addition to your 50mm vs 30mm confusion). The colors represent a range, not a value. The values only occur at the intersection of two ranges. For example, on the 1950-present map, the darkest corner on the maps only represent the range 20mm/decade to 30mm/decade, not necessarily 30mm/decade. The highest value might be only be 20.1mm, 25mm, or it might be 29.9mm, and the highest values would occur at the fringe of the range (i.e., a small area). Nevertheless, we can stick with using the top of the range (e.g., 30mm/decade) as a matter of “worst case” convention for the sake of discussion. But it should be emphasized that this is a “worst case” and likely an exagerration of the actual value. Regardless, coupled with trend maps from 1950-present here http://www.bom.gov.au/cgi-bin/silo/reg/cli_chg/trendmap.cgi?page=cc&variable=rain&region=wa&season=0608&period=1950 1960-present here http://www.bom.gov.au/cgi-bin/silo/reg/cli_chg/trendmap.cgi?page=cc&variable=rain&region=wa&season=0608&period=1960 , and 1970-present here http://www.bom.gov.au/cgi-bin/silo/reg/cli_chg/trendmap.cgi?page=cc&variable=rain&region=wa&season=0608&period=1970 , it is STILL clear that the majority of winter rainfall decrease in the far southwest corner occurred prior to 1970. From 1970-present, only a small area has had a decrease in rainfall, and it is on the order of less than 10mm/decade. This is far slower than the rate of decrease from 1950-present (up to -30mm/decade) and 1960-present (up to -30mm/decade), which implies that the 1950-present and 1960-present periods were starting with years much wetter than today’s. The 1950-present and 1960-present timeframes include the 1970-present timeframe. So in order for 1950-present and 1960-present trends to be -30mm/decade and the 1970-present trend to be -10mm/decade, the rate of rainfall decrease has to have tempered substantially relative to 1960 (which, as stated in my previous post, conflicts with your claim that “…winter rainfall has ben declining steadily since the 1960’s…”) or 1950 (which is the period from which you now what to start with). If this were not true, then the 1970-present trend in the corner would be -30mm/decade (or worse) to match the 1950s-present and 1960-present maps. So according to the maps, the 1950s and 1960s saw a dramatic decrease in winter rainfall for the area in question, and things have been relatively “normal” (relative to the present) since 1970. In fact, looking at all maps available, the “best” case one (least decrease in annual winter rainfall) is 1970-present! If climate change is responsible for the 1970-present decrease in rainfall, does it also get the blame for 1900-present, 1910-present, 1920-present, etc, which are even worse? Even the most seriously affected portion of winter rainfall in the far southwest part of Australia is -10mm/decade or less since 1970. That’s less than or equal to 1mm/yr. Get out a ruler and look at how big 1mm is. Can you point to that decrease in annual winter rainfall and say that’s due to climate change (which is what you implied in #10), or that it’s even of any significance? Or even outside the realm of measurement error? And since the raw data shows drastically reduced winter rainfall for 1999-2004 for the composite map (which, I acknowledge, is an area larger than the far southwest portion of Australia…still, you said rain variability for most of the map outside of the area in question wasn’t seasonally variable, right? ), I wouldn’t be surprised if the 1970-2000 trend, even in the furthest southwest portion of Australia, would’ve been completely flat (or positive! ), and brought-down for the 1970-2004 trend by the 1999-2004. I’d have a hard time blaming climate change for a 34-yr trend of rainfall deficiency if the first 29 yrs (or more) of the period don’t have such a trend. Now if you go back to the 1950-present and 1960-present maps, where the decrease in rainfall in the far corner is up to 30mm/yr, then maybe you’d have some grounds to say there’s a significant change in winter rainfall and that climate change could be a contributor. But that 1970-present map shows those effects were basically gone by 1970, which leads me to believe other factors are at play. “Furthermore there is extensive and long standing documentation of this rainfall decrease which was first observed back in the 1980’s and has continued. According to what is shown on the Bureau of Meteorology maps, this decreasing rainfall may have been substantial in the 1950s and 1960s, but not since 1970. If you feel the Bureau of Meteorology is publishing bad or incomplete information, maybe you should share that long-standing documentation with them so that they can correct their data and maps instead of accusing me of lies. So nothing else has changed in the last 40 yrs that has helped lead to water conservation? Couldn’t conservation of water be due in part to increased water demand due to population growth, agriculture, etc? Couldn’t changes in land-use attribute to increased runoff and decreased aquifer/soil recharge? These contribute to water shortages elsewhere (and are often the cause). It’s not always a factor of decreasing rainfall. Or is the far southwest corner of Australia 100% identical in land use, population, water demand, etc, to what it was 40 yrs ago? I may be ignorant as charged, but if so, then I blame your Bureau of Meteorology for producing maps and releasing data that conflict with reality (at least as you see it). All I know about winter rainfall is southwest Australia is what I can read on maps or download as raw data, and I think most anyone who reads those maps would raise the same questions I did. Granted, things might look different if different starting periods were used (e.g., 1955, 1965, and 1975 instead of 1950, 1960, and 1970…we all know about how different trends can be based on the bookends used to present the data! ), but that’s a limitation of the BofM website. Still, the regional raw data for which annual winter rainfall data is available seems to support the idea the conclusions would be similar. If there’s better information out there, I’d be happy to see it. I’m not saying you’re wrong, just that the info at your BofM conflicts with your conclusions. Feel free to point me in another direction. You need to step back for a second and look at what the claim of H2O feedback actually is. It’s a claim that because of higher temperatures near the surface, additional water vapor will evaporate. But this means that eventually (an average of 10 days according to what has been posted here) this water vapor must return to earth as rain. But to produce rain it must first form clouds. And therefore the water-vapor feedback mechanism requires additional cloud formation. This is as near to a sure thing as we can expect in this entire global warming debate. The real question is where and what sort of additional clouds will form and whether or not they will serve as a negative feedback to the water vapor’s positive feedback. I’m a bit disappointed that I didn’t get any substantive response to this question. But perhaps someone will make a response this time. In response to #19 and #35. Cloud formation requires sites for nucleation (cloud condensation nuclei or CCN) where water vapor can precipitate out. These can be dust particles, liquid aerosol particles, etc. It is not enough simply to say that additional water vapor will lead to more clouds (however, if the relative humidity is low, and the availability of CCN is not limiting then you will get more clouds given higher humidity). The study of cloud formation still has many “here there be monsters” unexplored areas although troops are massing on the borders with new weapons in the war against ignorance. http://www.agu.org/revgeophys/rasmus00/rasmus00.html is an on line review of cloud physics by Roy Rasmussen at NCAR. I see no place for political ideology in Science, do you? If your going to start leaving hints scattered covertly through your messages that you’re a good leftist I’m going to quit regarding anything that’s posted on this website as being relevant to Science. I know that Carl Sagan tried to politicize Science but he made no original contributions to knowledge or furthered understanding of Nature. I hope the aspiring scientists who post here are not going to sink to the level of sociologists lost in the mire of their own verbal solipsism’s. So Eli, be explicit. Are you claiming that more and more water vapor accumulates in the atmosphere until it just rains out without forming clouds if the levels of CCNs are low or what? We’re talking mass balance here, not some obscure mechanism on how water vapor is converted to water droplets. And just how large would the typical area be which is depleted of CCNs? Given salt from the oceans, dust from deserts, aerosols from trees and industrial operations and soot from fires man-made and otherwise, I’d not think it’s a great area. Francis (response 30): Where were those CO2 data taken? How much of the variation is accounted for by plants vs. other sources such as emissions from vehicles upwind? Well Dave, if the boundary layer exchange is not important, how do you account for movement of CO2 into and out of the oceans? If there were no CCNs, there would still be a mass-balance equilibrium due to this layer set by the Clausius-Clapyron equation. OTOH, you have a non sequitor there as nothing can “rain out” without the formation of clouds. Yet there can be exchange of water vapor in the atmosphere with the oceans near the surface, especially given the turbulent nature of the ocean surface and the presence of salt spray. True, I am not going into great or any detail here, but simple googling will toss up a number of aerosol models for clouds, many papers on the role of the boundary layer as well as a raft of studies on the different types of aerosols. Perhaps one of our gentle and learned hosts will provide an article containing the detail you crave. FWIW, the largest volume with few CCNs is the upper troposphere and the stratosphere. Uh Eli, the ocean is almost all water. For it to equilibrate with the atmosphere would result in more water vapor entering the atmosphere, not part of the existing vapor entering the ocean. The same is not true of CO2, so talk about non-sequitors! Please explain what you mean by that in this context. CO2 is as it were miscible with the rest of the atmosphere (except perhaps at very high altitudes.) H2O has a maximum [stable] concentration at a given temperature and pressure. Now you’re right about there being few CCNs in the upper atmosphere, but at the same time the temperature is so low that it doesn’t take much to cause clouds to form and often they’ll form of their own accord. I don’t deny it’s a complex situation, but that’s precisely why it’s so dangerous for climate change people to imply that all the important details are known and the models are so robust that we can make wise policy decisions based on what we already know. Dave, this point is incorrect. The oceans and atmosphere also strive for equilibrium in terms of CO2. As the oceans warm (as they are doing today because of increases in global temperatures), the ocean has a reduced carrying capacity for CO2. Therefore, CO2 is released from the oceans into the atmosphere. (Therefore, the oceans can no longer be considered a carbon sink, but a carbon emitter.) As the oceans cool (as has happened in the past), the carrying capacity for CO2 increases, therefore acting as a carbon sink. I’m absolutely confident in my assertion that CO2 levels vary heavily during a 24 period (CO2 measured at ground level in a “normally” green planted area); these variations surely will be much smaller in a bare plant-less environment. I measure CO2 since over 15 years, with different instruments (all NDIR, but of increasing sophistication, the latest being a WMO agreed MIR9000), and in different environments: underground (in a maze cave), in a forest, and since 1996 in a meteorological station (http://meteo.lcd.lu, sampling inlet 25m above ground level) in nearly rural Luxembourg: rather small town (Diekirch, pop. 5000), no heavy industry, no large emitters upwind, rather low traffic. In my opinion, a big part of these variations is caused by photosynthesis (there is a good negative correlation with solar radiation, much better in summer), another with the usual morning inversion layer at groundlevel. Traffic and industry definitevely are not much involved (we have two “mini” commuter rush-hours at 06:00 UTC and at 15:00 UTC, and at least the last does not show up in a CO2 peak). You will find among others a plot of “real” Tennessee data from CDIAC confirming my point of view. Congratulations Gavin, on demonstrating the commonest failure of the beliefs of pro-global warmers on this weblog and elsewhere: that climate models and their program inputs are themselves scientific data and can prove or disprove anything at all. They are parameters for a computer program, not experimental data. The distinction, I know, is lost on you. But for the rest of us, the fact that you claim to simulate a climatic event in a simplistic model of a non-linear system like the Earth’s climate does not lead to the conclusion that the model simulates reality or has diagnostic value. For example we do not know the “publication bias” of exactly how many computer runs, twiddles, tweaks, “flux adjustments”, and other parameterizations were done before you got the “right” answer. If you’d have actually referred to real experimental data, then I might have been impressed. More impressed if someone else could replicate your work. Really, really impressed if it could so much as predict the next El Nino. The IPCC also ignores in that diagram the greatest climate forcing of all: the variation of the solar flux because of intrinsic variation as well as changes in the orbital geometry of the solar system. The IPCC simply implies that the solar contribution (without a scintilla of scientific justification) is more than three times smaller than that from carbon dioxide alone even though such a parameterization is characterized to be on a “very low” level of scientific understanding. How the IPCC got to this conclusion when the clear imprint of solar variation on climate has been described by multiple teams over many years (dear me, and they were peer-reviewed and published in quality scientific journals as well), is simply beyond me. I think the IPCC should get out more from its deterministic, politicized ghetto and smell the scientific air. I doubt very much you’ll allow this to be posted, since censorship of opposing views is what realclimate is famous for, but I’m an incorrigable optimist (or just a fool wasting his time). [Response: This kind of tiresome posting is exactly the kind of thing we try to avoid on this site. Mainly because it adds nothing but noise to the debate. However, as an exercise in reasoned discussion, I will take the time to point out the numerous problems with your point of view. – I have not claimed to ‘prove’ anything. Given a system like the Earth’s climate, the best one can hope for is a reasonable match to observations. Radiation models (such as I used here) have matches to line-by-line observations good to about 10%. All I did was demonstrate in those models the importance of various terms. That the results are similar to those from a completely different model (RC78) written over 20 years ago should indicate that they are reasonably robust. – Climate models cannot be “used to prove anything at all”. The proof of that is that no-one has ever made a model that cools when greenhouse gases increase. – A straw man eh? How about this particular gathering only a day after my article? (William Kininmonth paragraph 11). I would also point out that it is bad debating style to claim that an argument is a straw man, and then go ahead and use it. – Orbital forcing over the period 1850 to 2000 is neglected in the figure for the obvious reason that it is small, and in particularly in the global mean, very close to zero (and with very little uncertainty). – Long term solar forcing estimates by contrast are indeed rather uncertain, and so your confidence that they must be must larger than accepted by IPCC is curious. Uncertainty works both ways remember. The numbers used by IPCC come from reasonable extrapolations of the measured values of solar irradiance during the satellite era – and there’s much more than a scintilla of scientific evidence there (Lean et al, 1995, Lean 2000, Foukal 2004 etc.). I have actually written a number of papers on the solar forcing of climate, and your claim that the observations imply a much larger recent solar forcing is simply not supported by evidence. Cooling during the Little Ice Age for instance is completely consistent with the ‘IPCC’ forcing (solar and volcanic), canonical climate sensitivity and the historical temperature data (within the uncertainties of each) (see here). If you have a direct line to someone who has demonstrated otherwise, let me know. – I cannot comment on your optimism. But I have formed an opinion on your foolishness…. sorry gavin, I misunderstood the meaning of your “I stand corrected” (blame my poor English)… so we may close the debate on daily CO2 variations. It is strange that online hourly or live CO2 measurements seem to be extremely rare (and/or difficult to find), whereas data with daily and monthly CO2 means are plenty…. I didn’t say there wasn’t a tendency toward equilibrium with CO2. I said (or rather implied) that it results in CO2 being taken up by the ocean rather that vice-versa. This is not the case for water vapor. Instead water vapor enters the atmosphere and would continue to rise in concentration if it wasn’t for the fact that water eventually condenses and thus returns to the oceans. And CO2 doesn’t enter the atmosphere from the oceans on net. It may be that the total amount which can be take up will eventually plateau, but don’t confuse such a future event with the present situation. In fact, the amount of CO2 entering the ocean has been rising, as it would be expected to. Furthermore, if you look at the balances for the surface waters compared to water returning from the depths, there is actually more CO2 rising that being conveyed to the depths. This is because phytoplankton converts CO2 to biomass and eventually this rains into the depths. At some point it’s possible that this situation will reverse and the water being taken to the depths will be richer in CO2 than that upwelling, but there’s still quite a way to go before that happens. What may be confusing you is that the % of emitted CO2 being absorbed by the ocean is now smaller than it was in the past. But the actual amount being absorbed is still increasing. Failing to look at the RATE at which water phase changes is based on assumptions that this RATE is the same throughout the dynamic. It is not. That RATE varies ELECTRICALLY. If you are interested in the mechanism involved, visit us at the tropics thread at TWC bb. You make the incorrect assumption that the rates of CO2 exchange with the ocean is constant when it indeed is not. There is an good Nature paper on the subject by Bates et al with the study of Hurricane Felix descussing CO2 uptake. Further, hurricanes offer the most intense large scale electrical couplings on earth, between ionosphere and ocean, and those couplings change surface pH, which then varies uptake rates at the most significant times–when they impact cloud microphysics processes. If you are not looking at large scale electrical features and biological activity, you don’t know spit about CO2 and climate. CO2 is ELECTRICAL and hyper critical in gas exchange from surface lows in determining relative conductivities. The earth is very much alive in this context. Have you taken into consideration along with your orbital discussion gravity changes? That is discussed in this paper here, for instance? This in my view gets to orbital patterns and how roiling gas exchange and CO2 functions (which the biosphere modulates) in the oceans and which impacts conductivities. So looking merely at the sun misses both that the LIA is a function of the moon orbit and misses that the relationship to CO2 is DEPENDANT. A set of double blundering. RE #44 & models (which I know were covered earlier on this site), I was thinking about correlations v. causation. In sociology we often use surveys & load up lots of variables (as controls for the variables of interest). That’s because in the real & highly complex world it is difficult and/or unethical to do experiments on human social behavior. Experiments give the strongest proofs of causation. Correlations & other association stats do not prove causation (as tobacco companies so gleefully used to claim, until celluar level proof of tobacco causing cancer came along), but correlations do give good indication of causation, when other (thought to be) impacting variables are controlled for, and when using good hypotheses & thought – e.g., about which variable comes 1st & which comes 2nd. It’s better than no study at all and a “know-nothing” stance. I don’t know if this is analogous to climate change studies, but an important point is that we have only one earth on which we all depend for our lives, so it is totally unethical to experiment on it — and we really should stop emitting so many GHGs (at least those we can reduce cost-effectively — which would be more than a 50% reduction for the U.S. given current technology) & halt this experiment right away before we prove just how harmful GW can be. Predictive climate models seem like the second best approach, after the all out “see if we can greatly harm the earth” experiment, sort of like surveys in the social sciences — though H2O and even wind behave more predictably than people — they don’t have all sorts of mindsets and weird motives. So climate models should be much better than what the social sciences can come up with (unless, of course, you add in the human factors). By the way, even if water vapor were somewhat of a forcing (which I’m sure glad it is not) or volcanos started spewing out massive GHGs, that would still not get us off the hook about our need to reduce our own GHGs. That’s like saying it’s OK to kill a few people, because Hilter killed millions. Focus shifting or changing the topic (e.g., from CO2 to H2O) is a dishonest tactic in argumentation, commonly used in marital disputes.